At the Law Enforcement Training Institute, we offer a Class A-certified 600-hour basic training academy. You will receive almost 700 hours of training that exceeds Missouri's minimum requirements for peace officer certification. For 15 to 16 weeks you will attend a progressive and fast-paced academy that will earn you not only peace officer certification, but certification in 12 other topic areas. This means that you will finish sooner and be more prepared to go to work as a peace officer. You receive real-life, hands-on training — from how to protect yourself, to how to take notes, to how to conduct an arrest. 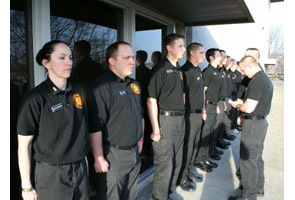 You learn practical application of law enforcement techniques as well as gain access to training not typically provided in other academies' basic POST-approved courses. The moment you punch the clock on day one, you are assigned a squad, squad leader and chain of command. You are treated like an officer, and you are expected to act like one. This intense training is modeled after a real police department. You sign in and out on a time sheet every day and work in 15-minute increments. If you are late one minute, you are late 15 minutes — just like a real job. Our faculty is one of the most distinguished and widely recognized groups of professionals in law enforcement training. Every lesson is taught by an expert who has spent his or her career performing in the field. For instruction in specialized areas, our instructors are joined by leading attorneys and other state-certified professional law enforcement trainers. These experts provide an outside perspective that complements our curriculum. At LETI, our entire institute is dedicated to developing excellent, well-rounded officers who are leaders in their respective areas. Being a police officer is a tough job. You take on tremendous responsibility. It's imperative that you fully understand all the ramifications. Our job is to prepare you for any scenario you could possibly encounter. For instance, in addition to rigorous mental and physical training, you will be pepper-sprayed. It's not fun, but it's part of the job. If you have to use this weapon on a fellow citizen in your community, you have to understand how it works. Police officers love what they do. Helping communities stay safe is their passion. And we take pride in turning those passions into careers. Our training program places you on the path to becoming a police officer, deputy sheriff or other law enforcement professional. Along the way you will create friendships that will last a lifetime. The brother- and sister-hood in law enforcement transcends fields, borders and time. You and your classmates will build the foundation to become successful leaders in the profession for the rest of your careers. 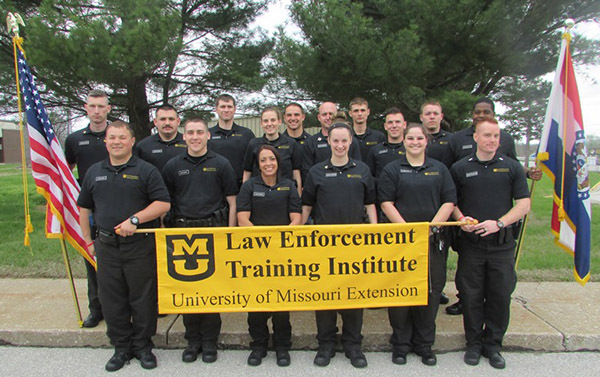 LETI is the academy of choice for police departments around the state of Missouri. On average, 90 to 95 percent of our graduates who are actively seeking a law enforcement career are hired within the first six months of completing our program. Sallie Mae's free scholarship search is the perfect solution to anyone looking for a scholarship to help pay for their LETI training. Your search will provide access to an award database that contains more than 5 million scholarships worth more than $24 billion and is expanded and updated daily. By registering, you will automatically be entered in their monthly drawing for a $1,000 scholarship giveaway. Start your search. Private Education Loans are funded by banks and other private lending institutions. Students who need additional funds to pay educational costs and who have exhausted other funding resources, may consider borrowing private education loan. This option should be carefully considered. Lenders may require a co-signer. A co-signer signs the promissory note promising to repay the loan if you don’t. After you enter repayment, some lenders offer a co-signer release. To determine your eligibility for a co-signer release the lender will require a specified number of on-time payments of principle and interest and will pull your credit score and history. Interest rates are directly related to the credit rating of the borrower and/or co-signer, so choose a co-signer who has a good credit score. The following loans are available to students enrolled in the Law Enforcement Training Academy. This loan is available to students enrolled full-time, half-time, and less than half-time. Any creditworthy adult willing to borrow on the student’s behalf. The student may not be the borrower. Borrower, cosigner, and student must be U.S. citizens or U.S. permanent residents.